What's that thing crawling on my plant? In this section we will share the most common pests in the vegetable garden in the warm months. Please use the Quick links or scroll down to see the information. For a better view of the problem, pictures below enlarge when clicked. Still don't find your special vegetable problem? Contact our office or bring a sample to one of our events. 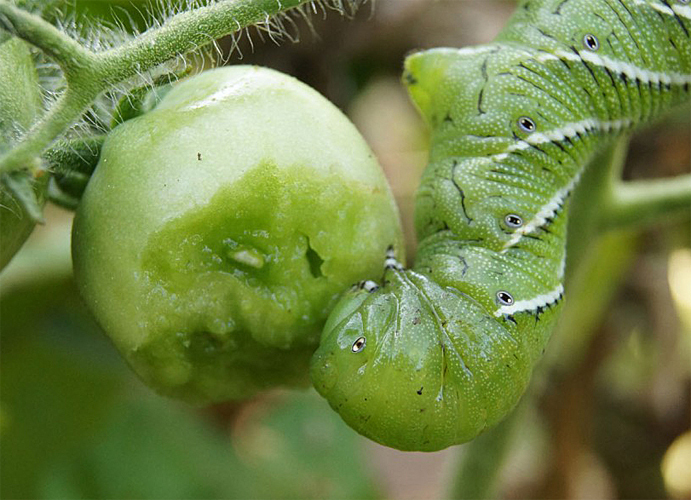 Hornworms are voracious feeders that cause noticeable damage to tomato plants. The two hornworm species found in North America are the tobacco hornworm (Manduca sexta) and the tomato hornworm (Manduca quinquemaculata). Larvae of the tobacco hornworm (the most common hornworm in our area) are green with seven white stripes (see top photo). Tomato hornworm larvae are also green but have eight chevrons on each side of the body (note lower photo on the left). 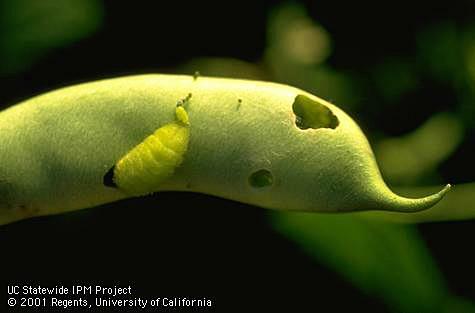 The larvae of both species are large when in their final stage before pupating. They have a single upright horn at the end of the abdomen. 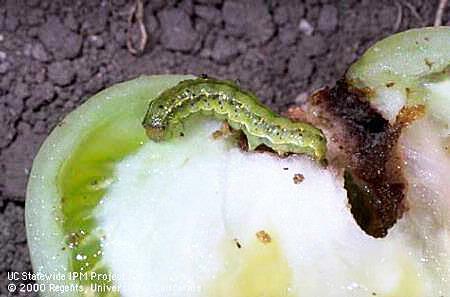 Damage by hornworm larvae is usually most common in midsummer, but there may also be a small population peak of larvae in the late summer. The larval form is the only stage that causes damage. Eggs are laid singly on leaves. 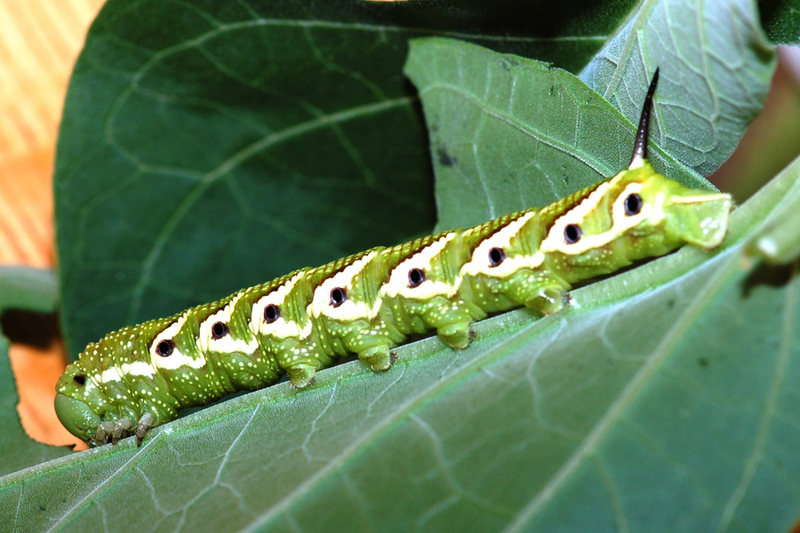 Larvae feed for 3 to 4 weeks, then the mature caterpillars drop off of plants and burrow into the soil to pupate. 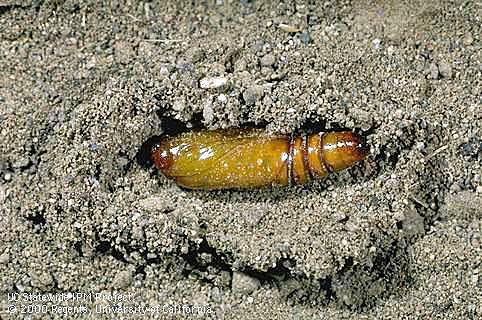 The pupae remain in the soil through the winter while the adult develops, then emerges in spring. 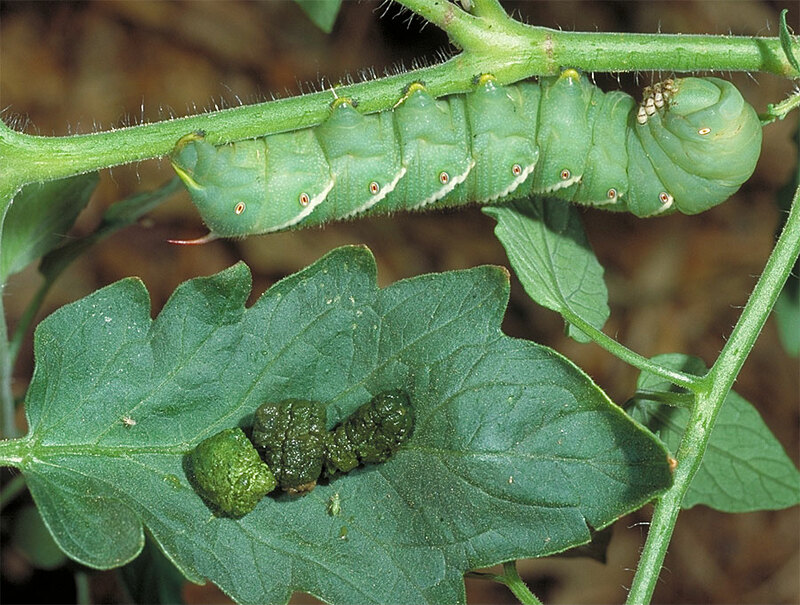 Hornworm larvae chew holes in tomato foliage and sometimes eat the green fruit (photo on the left below). 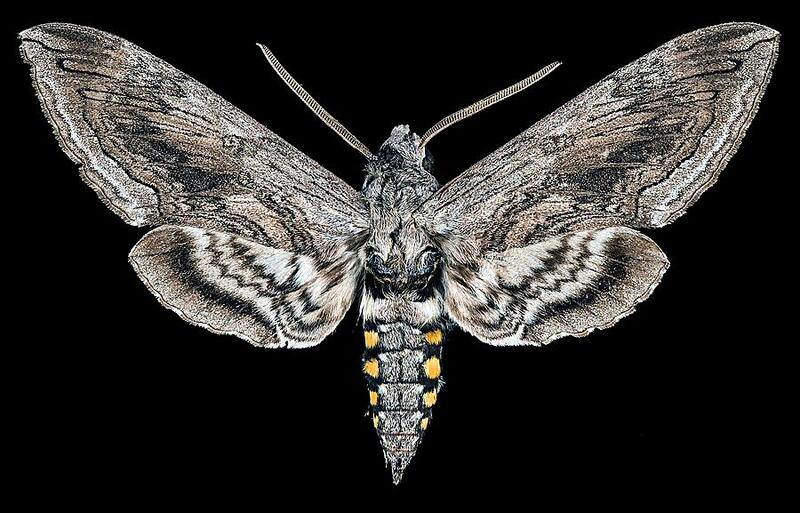 Hornworm adults are known as hawk moths or sphinx months (photo below). The moths are large and often confused with hummingbirds. They are most often seen at dusk hovering over flowering plants. The caterpillars are difficult to see because they are the same color as tomato leaves, but the frass (poop) and eaten leaves are easier to see. Handpick the caterpillars at all stages and dispatch them in whatever manner is comfortable for you. Try snipping them in half with pruners, squashing them with a brick, or feed them to chickens. Bt (Bacillus thuringiensis) can be sprayed when caterpillars are small, but it is not very effective on larger caterpillars, so handpicking is often the best solution. Bt is highly selective; it kills caterpillars and is not toxic to their natural enemies. The bacterium is harmless to humans and animals and is considered environmentally safe. 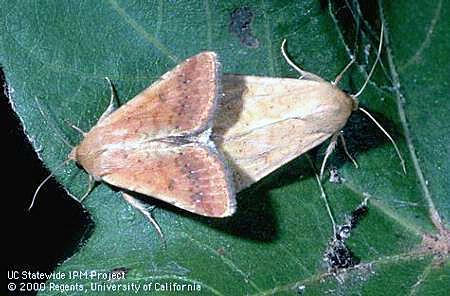 UC IPM Online, Statewide Integrated Pest Management Program. Compendium of Tomato Diseases and Pests, Second Edition - 2014, The American Phytopathological Society. Bt for Caterpillar Control (PDF) - Vegetable Information and Research Center, University of California. 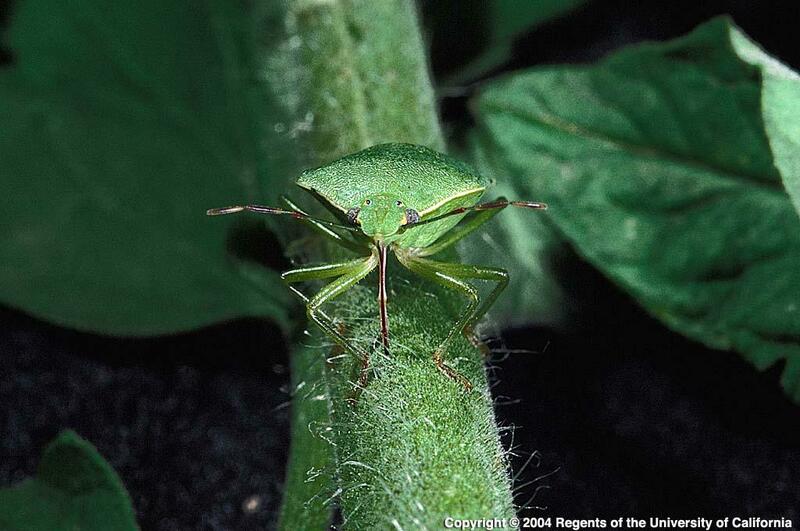 If you see yellowish spots on your tomatoes, you probably are seeing damage from stink bugs and/or leaffooted bugs. 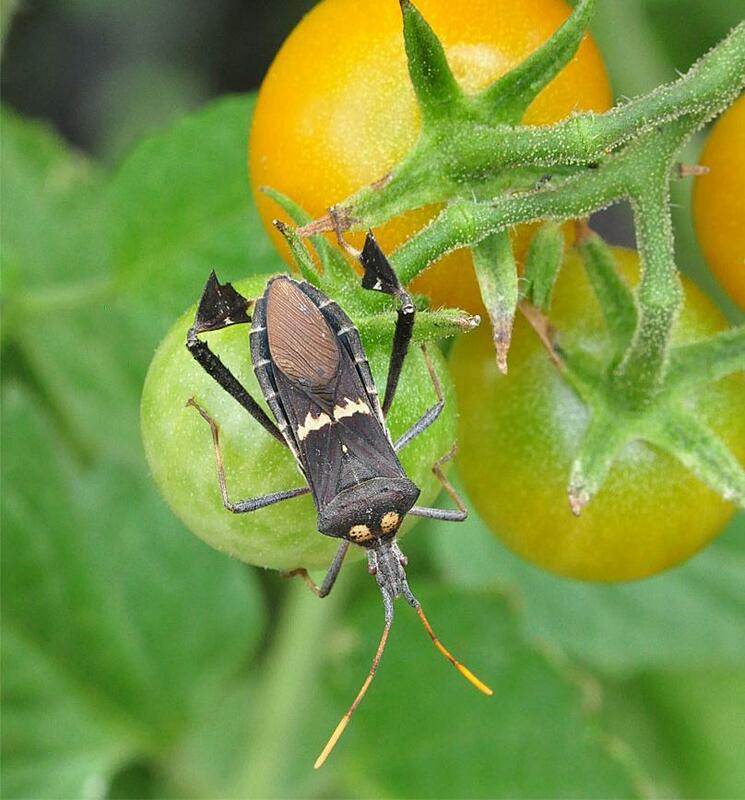 Several species of stink bugs and leaffooted bugs are common pests of tomatoes. 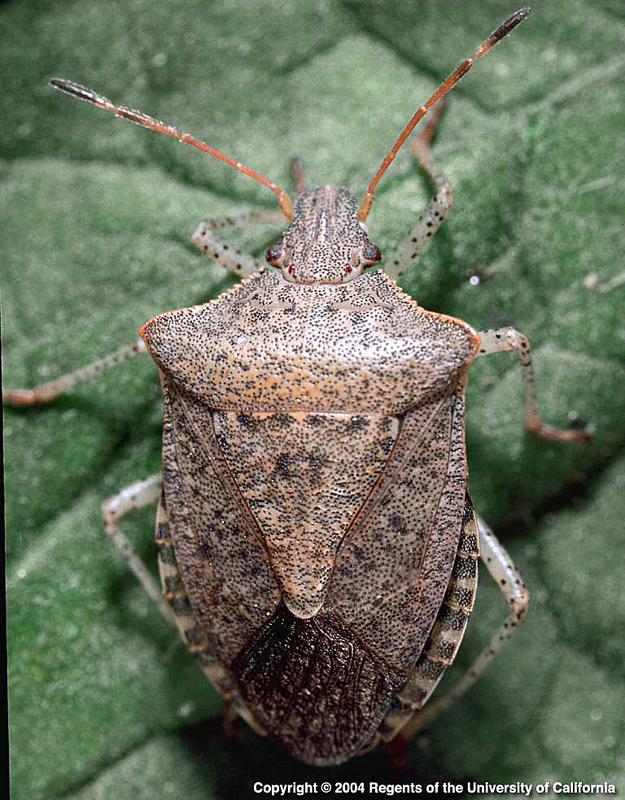 Stink bugs are shield-shaped bugs with a large scutellum (triangle) on their backs. Most bugs are brown or green with red, pink, or yellow markings. See them below. Stink bugs and leaffooted bugs attack a variety of fruits and vegetables from stone fruits to pears to beans to tomatoes, often leaving blemishes, depressions, or brown drops of excrement. On green tomatoes, damage appears as dark pinpricks surrounded by a light discolored area that remains green or turns yellow when fruit ripen. Areas beneath spots on tomatoes become white and pithy but remain firm as the fruit ripens. Fruit is edible. If the pithy area bothers you, it can be cut out by peeling the fruit. Become familiar with eggs, nymphs, and adult bugs and handpick them. Visit UC IPM Online links below to find photographs of eggs, nymphs, and adults. Eliminate groundcovers or weedy areas in early spring before populations build up. 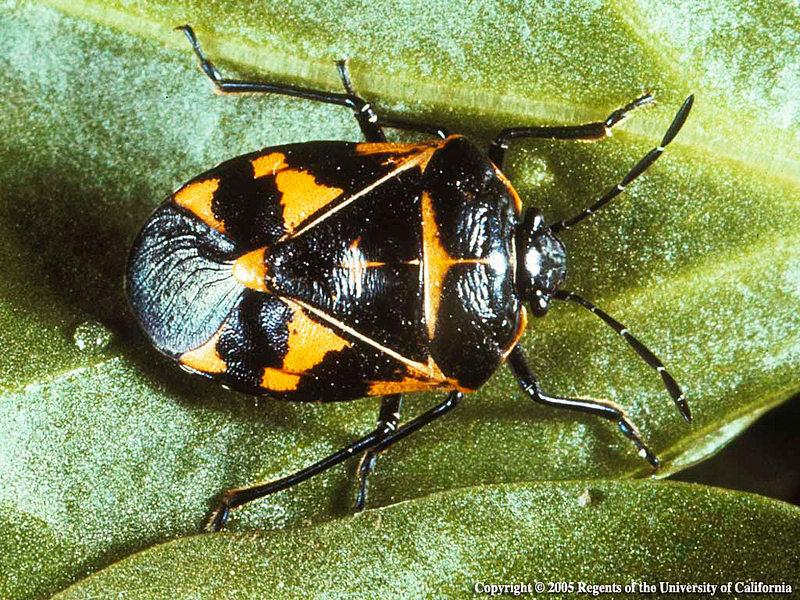 Insecticides are generally not recommended in gardens for stink bugs or leaffooted bugs. Parasites and general predators may contribute to control. 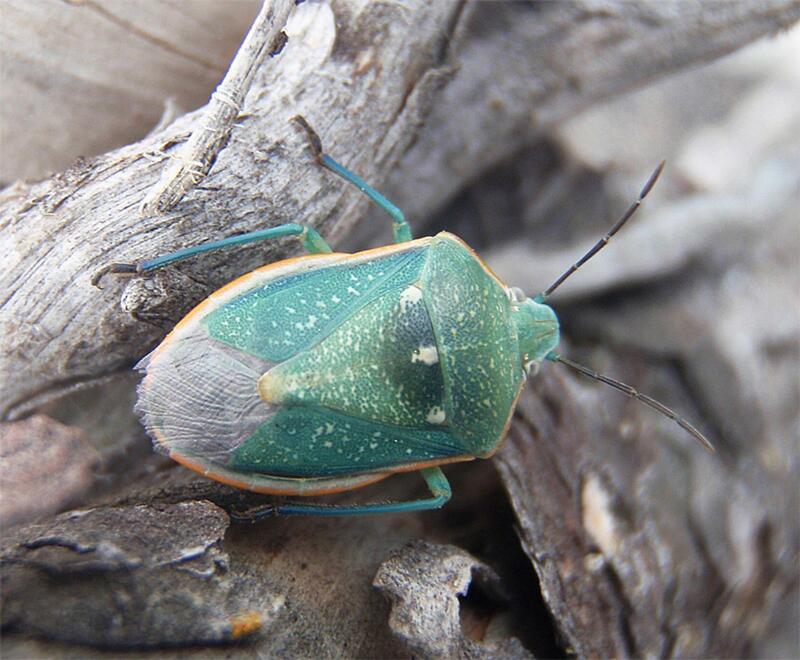 Stink Bugs - Pests in Gardens and Landscapes, UC IPM. Leaffooted Bug - Pest Note, University of California, Agriculture and Natural Resources, Publication 74168. Food Safety in Your Home Vegetable Garden (PDF), University of California, Division of Agriculture and Natural Resources, Publication 8366. 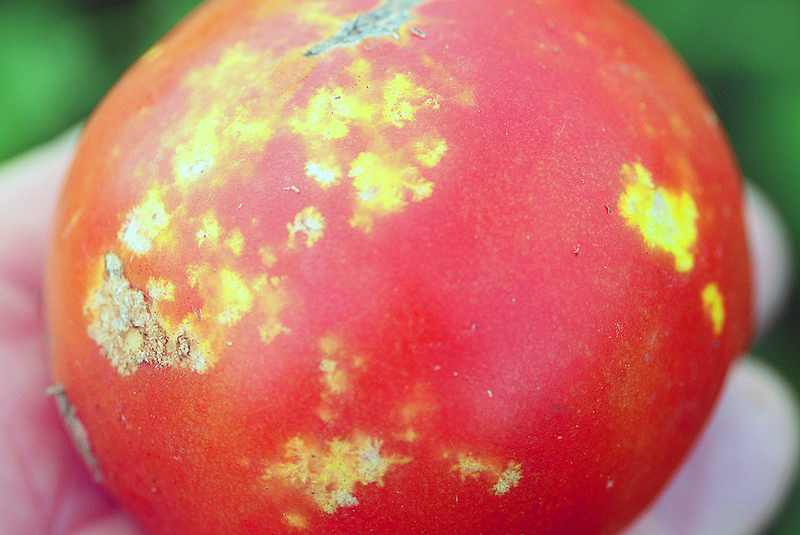 If you have noticed holes in your tomatoes, you may have the tomato fruitworm. The color of this species varies and is not reliable for identification. Older larvae have distinct stripes along sides and many short, whisker-like spines over the body surface. This caterpillar feeds on many vegetables and flowers. It leaves deep watery cavities in tomatoes, eats through kernels of corn, destroys lettuce seedlings and bores into heads, and it feeds on leaves, buds, flowers, and pods of beans. The caterpillar enters tomatoes at the stem end, usually while the fruit is green. It will complete its larval development inside the fruit. Its feeding results in a messy, watery, internal cavity filled with cast skins and feces. Damaged fruit will ripen prematurely. Handpick the caterpillars if you find them. Avoid spraying with insecticides. Bacillus thuringiensis (Bt), a biological insecticide, may kill 40% to 60% of the population but must be applied just after eggs hatch and before caterpillars enter fruit. Spinosad may also be effective. Important natural enemies of the earworms include Hyposoter and Trichogramma parasites. General predators also feed on eggs and larvae. Plant early and harvest before late August. Disc or rototill plants immediately after harvest to reduce overwintering populations and prevent migration to neighboring crops. It is the middle of summer and your squash, melons, and cucumbers are growing well, when all of a sudden you find shiny, sticky stuff on the leaves. Plus there are tiny insects everywhere. This is probably the dreaded melon aphid. It is a small aphid that ranges in color from yellowish green to greenish black. The melon aphid develops in colonies and prefers the underside of leaves. 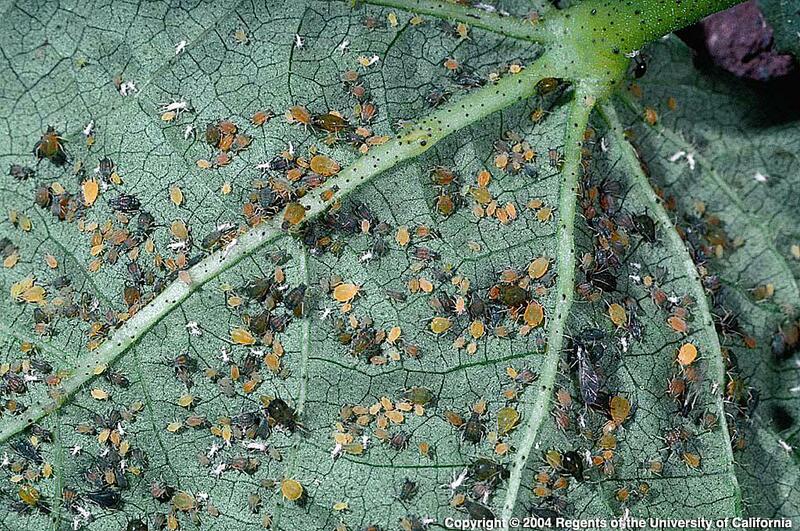 Unlike other aphids, melon aphid populations do not diminish with high temperatures. They can also be troublesome late in the season (September and October). These small aphids can be a major problem on young plants where they feed near the tips of runners or in growing points. They cluster in numbers on the underside of growing leaves, distorting and curling the leaves. Plus they produce a large amount of honeydew. The fruits become coated with the sticky secretion, creating an environment favorable for the development of a sooty mold. In addition, the melon aphid vectors a number of viruses, such as cucumber mosaic, zucchini yellow, and watermelon mosaic viruses, among others. Naturally occurring populations of the convergent lady beetle may provide effective control in early spring. Other general predators, such as lacewing and syrphid fly larvae, and parasitic wasps also attack aphids. Biological and cultural controls and sprays of rosemary oil, insecticidal soaps, and certain oils are acceptable for use in an organically grown crop. Rosemary oil is less disruptive of beneficials than soaps and narrow range oils. Be sure to read all labels carefully, as the oils and soaps can damage plants if applied during hot weather. Melon aphid is very difficult to control with insecticides. If natural enemies are present, they will help keep melon aphid under control until late in the season. Then your best bet is to remove the infested plants. Silver reflective mulches, installed at planting, have successfully been used to repel aphids from plants. This helps plants get off to a healthy start and are effective until expanded foliage covers the reflective surface. Lycaenid pod borer larvae are grublike caterpillars. Adults are tiny butterflies (photos below). Lycaenid pod borers bore into bean pods and feed on the beans inside. Holes in pods are common. They also may feed on leaves. 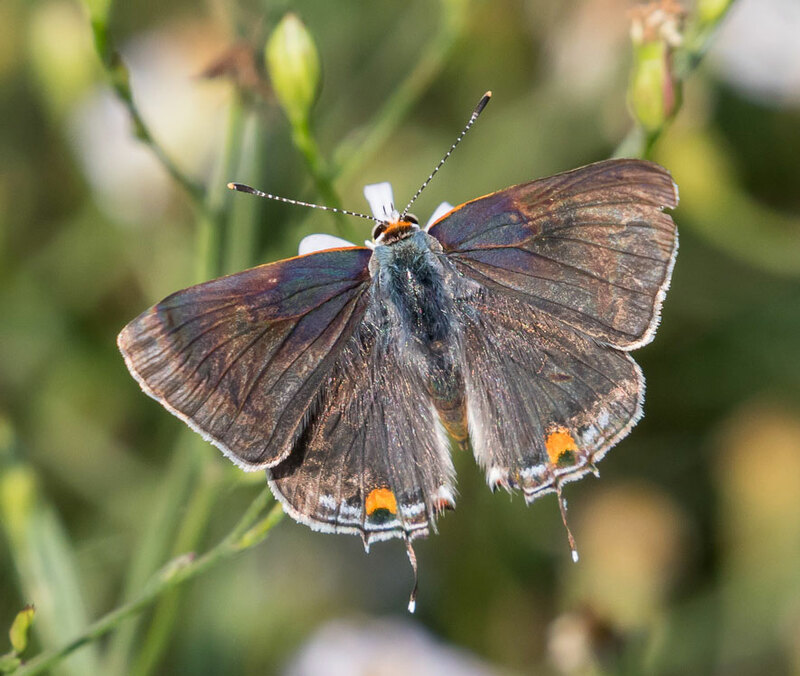 The adult butterfly feeds on nectar from a large variety of flowering plants. Handpick or snip caterpillars with shears. Natural enemies normally keep populations under control. Trichogramma parasites and Hyposoter exiguae (both are tiny wasps) may attack caterpillar eggs and larvae. There are also several general predators to keep populations under control. Bacillus thuringiensis (Bt) and spinosad are effective against smaller larvae. They overwinter in soil, so discing or rototilling after harvest can help reduce populations.